A couple of years ago, 1080p was the reference for high-quality displays. Anything below this was considered low end and price drops were raging. Since then, the situation has changed drastically, up to the point of 1080p being considered as mediocre… and even obsolete. But what does all this mean for a drone with 4K camera? With modern-day video game titles (for both consoles and PCs) adapting quickly to the new standard in resolution, 4K, it’s quite clear our good old 1080p won’t be able to cut it for much longer. 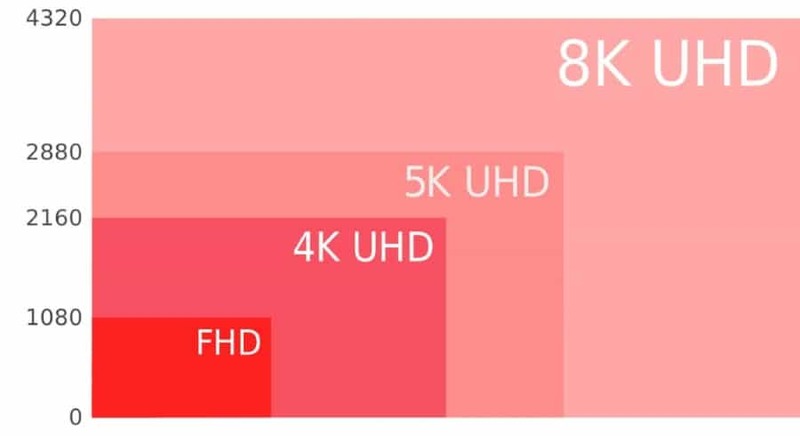 Yes, the majority of people are still using 1080p panels, but the transition to 4K has already started and it’s expanding rapidly… thus those who already transitioned are demanding more 4K content. That’s why, today, we will be taking a look for the best drone with 4K camera. As already stated above – the potential 4K-ready audience is rapidly expanding, so if you’re wanting to provide your clients with the best media consumption experience – drones with 4K cameras are the obvious way to go. However, If you want to make those aerial pixels count, you must prepare yourself for quite the spending as the top models go for rather vigorous amounts of money. With all that in mind, I suppose we can start off with our countdown of 10 best 4K camera drones! A good drone with 4k camera to start this list off is a miniature little fella that goes by the name Breeze. And it really is a breeze to fly! This is one of those selfie drones which are compact, usually foldable and have great cameras. The same goes for this one. It’s easy to fly, has several autonomous features and doesn’t require a professional behind the transmitter. Besides that, let’s see what else is this little bugger capable of! Until the release of DJI Spark, not a lot of selfie drones had mechanical image stabilization. As a matter of fact – there are only several models (including this one) which sport electronic image stabilization. As many of you already know, EIS trims the edges of your footage in order to stabilize it. This means EIS can’t work in the maximum resolution the camera offers. In other words, even with Yuneec Breeze having a 4K capable camera, if you turn EIS on the result will be in 1080p. So, you are basically forced to choose between shaky footage in 4K or smooth footage in 1080p. As for the actual image quality, I’d say this 13MPX camera does a pretty good job. FPS doesn’t drop plus Breeze sports 5 autonomous flight modes. They are as follows: Selfie, Pilot, Follow Me, Orbit, and Journey. Let’s get one thing out of the way – Yuneec Breeze is an absolute beauty. It sports a glossy white canopy with stunning silver decals. The camera doesn’t stand out from the general design and those landing legs, even though they look fragile, are actually quite robust. The main issues I have with Yuneec Breeze are its specifications. I don’t mind the flight duration that goes up to 12 minutes that much. In fact, I find it great in comparison to flight height which stretches out to only 80ish meters. It’s a selfie drone, I get it… But I still expected a bit more explorative spirit with Yuneec Breeze. If you’re like m, perhaps this next drone will be more your cup of tea. In contrast to Yuneec Breeze, Upair One is a huge 4k drone camera. Realistically speaking, it looks like one of those DJI Phantom copies… but it’s actually a solid all-around drone. The resemblance is there, no doubt about it (heck, even the transmitter looks similar to that of DJI Phantoms), but with an affordable price tag and great performance, can Upair One be a real Phantom killer in disguise? Let’s find out! This dashing 4K video drone sports brushless motors and has several cameras to choose from. 4K (obviously), 2.7K and 1080p cameras are available. Since the price gaps aren’t too huge, I warmly suggest going for the high-end 4K version. Another great thing about it is the fact that it sports GPS + Beidou positioning systems which ensure pinpoint accuracy. Also, they allow the return to home feature. 3 types of RTH to be more precise – Manual, low voltage, and signal loss. Altitude hold is another feature of crucial importance for Upair One. Thanks to AH, it’s able to capture smooth and steady aerial videos. The provided 2-axis gimbal does its share of the work as well, eliminating shakiness and providing controls over the camera positioning. Overall, there’s no doubt Upair One is capable of delivering excellent 4k camera drone performance! Considering the price you’ll end up paying for Upair One, it goes without any doubt that it offers great value for money. If the above was not enough to convince you, perhaps these next couple of paragraphs will. Starting off with the battery, Upair One sports a bulky 5400mAh 3S intelligent LiPo pack. It can keep it in the air for close to 20 minutes… even 25 without gimbal and camera mounted on it. Operating range is amazing too. You will be able to go as far as 500 to 600 meters. I almost forgot to mention Upair One sports 5.8Ghz FPV. It doesn’t go the full operating range distance but compensates for it with a large 7-inch display clamped on its stylish transmitter. When you consider everything mentioned, you’ll come up to a conclusion this is a very good affordable drone with 4k camera. When you put Vitus and Mavic Pro side by side you will notice Walkera’s model has a much more aggressive look. I, personally, love it and would choose it over DJI’s masterpiece at any time of the day. It’s a matter of personal preference though – I am sure some of you will prefer Mavic Pro’s more industrial design… but I can’t help it – I’m in love with this little birdie’s looks. Appearance aside – Walkera Vitus doesn’t perform badly either. With approximately 22 minutes of flight time and as far as 1 to 1.5 kilometers of operating range (thanks to the provided DEVO F8S transmitter), it wasn’t too far off Mavic Pro. The price difference was reflecting that as well… In fact, Walkera Vitus has a great 12MPX Sony camera recording 4K at 30fps and FHD at 60fps with up to 64mpbs bitrate and provides with FPV. Moreover, there’s even an integrated obstacle avoidance system that detects at roughly 7 meters of distance. So, if everything is rainbows and butterflies with this one – why hasn’t it live up to its expectations? The biggest issue with Walkera Vitus is their unpolished firmware. When this drone was initially released, a ton of advertised features was missing from the app. Even though they’ve fixed some of the issues, a few still remain alongside several notable bugs. The biggest one being random flyaways which were reported by several YouTubers. Unfortunately, if your best 4k drone ends up flying away, you won’t be able to get a refund since Walkera’s warranty policy requires you to send them your drone so they can check whether or not the mistake was on their end… These flyaways aren’t that common… but it’s still something to consider before purchasing Walkera Vitus. The best thing about GoPro Karma is that it offers a complete package. Not only are you getting the actual drone but you’re also getting a carrying case, a controller and removable gimbal. On top of all that, the biggest addition is definitely the so-called Karma Grip which allows you to take both aerial and handheld videos. As far as the video quality is concerned, GoPro Karma supports all the newest GoPro Hero models including the newest GoPro Hero 6 Black. 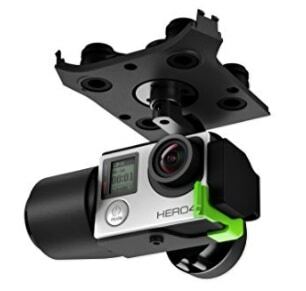 With that being said, once you mount GoPro Hero 6 Black on the removable gimbal and connect it to the drone, you’ll be all set to record amazing aerial footage. Sick and tired of flying or the battery is all gone? Simply take the Karma Grip and you are good to go – GoPro Karma allows both aerial and body-mounted/handheld footage making it the most versatile drone package out there. After the initial launch, all GoPro Karma models were taken off the shelves due to technical issues. Now that they’ve been fixed, it is safe to say that Karma offers pretty decent performance. The only bad thing to say about it is that it has marvelous competition. Mainly, I am referring to DJI Mavic Pro which completely wrecked Karma as soon as the first sale figures came in. Still, with up to 3 kilometers of operating range and somewhat of a solid 20-minute flight time, GoPro Karma seems like a pretty decent smart drone. Yes, it boasts GPS connectivity as well as a handful of autonomous modes such as Cable Cam, Orbit, Reveal, and Dronie. Autel Robotics X-Star Premium is a brilliant drone with 4k camera that’s considered to be an outright steal at the moment. It’s priced significantly lower than DJI Phantom 4 Pro but offers similar performance as far as aerial videos are concerned. Of course, the range is much shorter, but that’s only due to the fact DJI has the most advanced transmission system in RTF drones market. So, with all that in mind, let’s take a closer look at X-Star Premium and see if it’s a good replacement for DJI’s Phantom lineup of drones! Great performance… and then some! X-Star Premium is a premium grade drone, there’s no doubt about it. With a spectacular 4K camera and a couple of well put together autonomous modes, this thing can do a very good job in terms of aerial photography. It sports a 12MPX sensor capable of recording in 4K at 30fps. Lower that to FHD and you get 120fps and smooth slow-motion footage at your fingertips. With access to both GPS and GLONASS and HD live view via integrated LCD display – you basically get the entire package in one go. Even after taking a closer look at X-Star Premium’s specifications we will not find a single notable downside. It’s true! This birdie has roughly 2 kilometers of operating (and live video streaming) range, making it miles ahead of all other competitors other than DJI. Battery duration seems solid as well. That’s because Autel Robotics X-Star Premium can endure up to 25 minutes of being in the air and recording at the same time. Another key aspect of Autel Robotics X-Star Premium is the fact that it’s one of the most reliable drones out there. With all the latest safety gimmicks and pinpoint GPS accuracy, X-Star Premium is a commercially viable device capable of doing all sorts of demanding aerial tasks. Obstacle avoidance, GPS connectivity and full support for DJI GO app make this little bird an exceptional device. The app contains a ton of useful features, some for casual and others for professional usage scenarios. ActiveTrack and TapFly are 2 of the most popular ones as they represent easy methods of recording excellent aerial footage. As for the camera, DJI Mavic Pro relies on a powerful 12MPX sensor capable of recording 4K footage at 30fps. It’s mounted on a 3-axis gimbal that greatly contributes to the overall video smoothness and quality. After checking out a whole heap of features, I believe we should go back to the basics and notice just how small this thing is… especially considering what it has to offer. Marvelous performance and professional-grade camera in such a small package! And that’s the genius part about it! The fact that you’ll be able to take it with you wherever you go without it being too much of a hassle… That is invaluable and basically what makes DJI Mavic Pro that awesome. And this thing doesn’t fail to perform either. Another fantastic thing about it are its specifications. I kid you not – they are pretty much identical to those on the newest Phantom 4 models. Yes – that means DJI Mavic Pro has access to 7 kilometers and can fly for up to 27 minutes. The new DJI Mavic Pro Platinum even goes to half an hour thanks to certain tweaks and optimizations. Overall, if you’re in need of something commercially viable and small at the same time, DJI Mavic Pro is still the best drone for the job! Mavic Air is a serious contender for the title of best 4K drone 2018 for casual users. It’s small, lightweight, foldable and acts like a professional aerial camera. Basically, everything that DJI Mavic Pro is… but just a little bit smaller. With that in mind, is DJI Mavic Air a proper successor to the, now already aged, Mavic Pro? Or better yet – is it good enough to beat its predecessor? Is it good enough to beat DJI Mavic Pro? Obviously, there will be lots of DJI Mavic Pro comparisons out there. As a matter of fact, there’s already a number of them available on various YouTube channels and drone blogs. And why not – these 2 drones are direct competitors to each other, as far as I can tell. What I also can tell is that Mavic Air is actually better than Mavic Pro in certain aspects. Primarily, I am referring to camera gimmicks which have been slightly improved. Mavic Air has superior bitrates and higher frames per second in lower resolutions. More precisely, Mavic Air can record 4K at 30fps, 2.7K at 60fps and FHD at amazing 120fps. On the other hand, Mavic Pro records 4K also at 30fps but 2.7K and FHD at 30 and 86fps respectively. So, if bitrates and low res fps are accountable measures, then Mavic Air definitely is good enough to beat (or be on par) with Mavic Pro. In terms of specifications, I’m sure the majority of you won’t believe their eyes. Of course, DJI Mavic Air has superior range and battery duration when compared to DJI Spark. However, it still hasn’t reached the heights of DJI Mavic Pro. You shouldn’t criticize this little bugger because of it – after all, it’s much smaller than Mavic Pro which is a big advantage nowadays. Moving forward to the actual specifications, Mavic Air can last up to 21 minutes in the air and fly up to 5 kilometers in clear and unobstructed areas. This means 5 minutes shorter battery duration and 2 kilometers shorter operating range which, at the end of the day, isn’t that much of a difference to begin with. In addition to Breeze, we have another one of Yuneec’s drones with 4k camera featured on this list. It’s none other than their impressive Typhoon H hexacopter with might specifications and great aerial task manageability. It might not have specifications as high as DJI’s newest models (and by specifications I primarily refer to flight time and operating range), but it still performs demanding aerial tasks making it extremely viable for all sorts of industrial uses. There are several versions of Yuneec Typhoon H available on the market. The one we are focusing on here comes with a successful collaboration with Intel. This collaboration resulted in Typhoon H having Intel’s RealSense technology which is basically a comprehensive and highly accurate obstacle avoidance system. That, plus 5-rotor failsafe feature, are the backbone of Typhoon H’s reliability meaning stress-free flights each and every time. There are other features that come with Yuneec Typhoon H as well. For instance, it sports Follow Me, Orbit, Point of Interest and many more… all used with the integrated display on its dedicated ST16 transmitter. Video link is in HD, brightness is OK and it’s generally easy for people to get a hold on the basics of controlling this giant. Yuneec Typhoon H supports an infrared camera which can be purchased separately. It’s branded by Yuneec and enables Typhoon H to perform various tasks which require infrared vision. Whether we’re talking about agriculture, wildfires, cable inspection or any other type of demanding IR work – Yuneec Typhoon H with its infrared camera can do the trick. However, the standard package comes with a standard CMOS camera which records in 4K and supports FPV transmission up to cca 1.5 kilometers. More precisely, it records ultra smooth 4K footage (thanks to a 3-axis gimbal it’s mounted on) at 30fps but the fps goes higher the more you lower recording resolution. Best drone with 4k camera ? The runner-up for the first spot on this list is the almighty DJI Phantom 4 Pro Plus. Yes, after DJI Inspire 2, this is the most capable commercially available model with an impressive 4K drone camera. However, it falls short of Inspire 2 solely due to the fact it’s not that much oriented for professional users and doesn’t sport such a powerful sensor like the one on Inspire 2. However, DJI Phantom 4 Pro Plus is still a brilliant drone with a lot to offer to anyone who uses it. Before jumping to all technical details and features of this little fella, I first want to say that I am simply charmed with its design. Of course, it has the traditional Phantom-style design, but this time around it’s an all-white finish with well-placed silver motors that add to the overall professional-looking appearance. Now that we got that gorgeous design out of our way, it’s time to move to the actual quality. Starting off with the features, you can expect basically everything DJI has to offer. This includes 5-directional obstacle avoidance with a plethora of sensors, fluid GPS connectivity, DJI’s Lightbridge transmission technology and a whole set of autonomous flight features including the every so popular ActiveTrack and TapFly. The only real addition to the Plus package of DJI Phantom 4 Pro is the integrated Android-powered tablet that comes with its transmitter. It’s pretty bright (1,000cd/m2), has 16GB of internal memory and sports a high quality 1080p display. The best thing about it is definitely its brightness which eliminates the struggle of viewing DJI Phantom 4 Pro’s FPV footage on your smartphone in direct sunlight. Specs are great too. Operating range, thanks to the previously mentioned Lightbridge transmission technology goes up to 7 kilometers. Battery duration stretches out to approximately 25 to 27 minutes, which is enough for a drone carrying such a good camera. As for the actual camera, DJI Phantom 4 rocks a 1-inch 20MPX sensor which records 4K videos at buttery smooth 60fps. With support for dual coding (H.265 and the newest H.265), aperture control and even a fully fledged mechanical shutter, this camera is second only to the newest Zenmuse X7 featured on Inspire 2. At the moment, the best 4K video drone is definitely DJI Inspire 2. As if there were and doubts about this one. Just from looking at this monstrosity you can conclude that it’s an epic drone. And still, as soon as it takes off and its arms raise up in the air to make room for 360 camera movement, you’ll be even more amazed by its presence… Furthermore, the performance is nothing short of brilliant too, especially the camera which is an absolute monstrosity. So, without too much small talk, let’s see what exactly am I praising this much. Inspire 2 is a feature-packed drone… and it should be considering the price it goes for. In addition to ActiveTrack and TapFly, Inspire 2 also has dual IMU, dual-signal propulsion system, dual battery design and even dual barometer. Yep – it’s like Noah’s ark in there, everything comes in 2’s. I should also note that some of DJI’s premium drones have the ability to be controlled by 2 separate controllers, including this one. Here is how it works – 1 person controls drone’s movements while the second one controls the camera orientation. This requires a lot of teamwork but can result in breathtaking aerial shots… especially with the Zenmuse X7. Considering the fact DJI Inspire 2 is primarily meant to be a robust aerial photography drone for professionals, it comes as no surprise to see a state of the art camera coming with it. Well, you can buy it separately too! Of course, I am referring to Zenmuse X7, the newest addition to Zenmuse X series which sports amazing all-around performance. With 6K CInemaDNG, 5.2K Apple ProRes and 24MPX stills, this thing outperforms all other commercially available camera drones out there. 14 stops of dynamic range and support for RAW output for post-processing allows professionals to take full use of this device without any limitations. Last but not least, when it comes to specifications DJI Inspire 2 basically has the exact same numbers as DJI Phantom 4 Pro. That means up to 7 kilometers of range and cca 25 to 27 minutes of flight time per charge. What are the most popular video resolutions nowadays? Before diving into the depths of video resolutions, first, we have to agree on the standard aspect ratio. While the majority of big-screen movies are made in 21:9 aspect ratio, 16:9 is still a standard for sitcoms, animated series and, believe it or not, the internet. More precisely – YouTube – works in 16:9 with only a small portion of videos being rendered in 21:9. What does this mean for the average user? Well, considering the majority of TV’s and monitors are 16:9, YouTube, sitcoms and general internet media consumption takes up the entire screen. However, newer movies will have black bars at the top and bottom since their 21:9 aspect ratio is stretched out on 16:9 displays. The same thing happen when 16:9 displays cast 4:3 videos, only this time the black bars are at the left and right side. That’s simply because of the fact the source and casting device’s aspect ratios don’t match. Now that we have aspect ratios out of the way, now we need to agree on the most popular 16:9 video resolutions nowadays. If we are going with more precision into this topic, then let’s get rid of the bottom 2 entries – 8K and Retina 5K. Why? Well, their representation is extremely low compared to the top 2. Is 4K UHD resolution two times as good as 1080p FHD? Given the fact that 2 most popular resolutions in drone world are FHD and 4K, it’s only logical to explain just how much better 4K resolution is. First and foremost – many people are convinced 4K is just double the size of pixels in comparison to FHD. This is wrong on so many levels and simple mathematics might fool you at first. 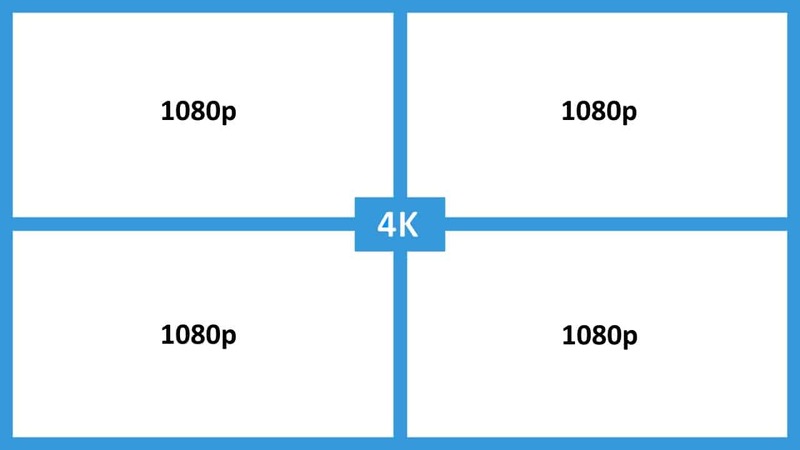 In reality, this means that a single 4K display can fit 4 FHD displays in a grid alignment as far as pixel count is concerned. With that being said, if you want a clearer image with more sharpness and details – 4K is the obvious way to go. Is video resolution the most important thing in a camera? Video bitrate is essentially the number of bits processed in a unit of time. For example, if a video runs at 1 megabyte per second, it has a bitrate of 8mbps (1 byte consists of 8 bits). This basically means that higher the bitrate, the better video quality is. Codecs are also important in this equation and should not be taken for granted. For instance, a video with the 6mbps bitrate in newer H.264 codec will look much better than a video with the same bitrate in the older H.263 codec. Frames per second or commonly known as FPS is a well-known characteristic for measuring the fluidity of videos. It represents exactly what its name suggests – the number of different frames the video shows in a unit of time (seconds). Using that formula, a 60fps video has 60 frames per second and will show much smoother and more fluid footage than a 30fps one. The majority of YouTube videos are played at 30fps with 60fps reaching popularity over the last 2-3 years. Image stabilization – how important is it for drone footage? Video resolution, bitrate and FPS all play key roles as far as image and video quality are concerned. However, besides quality – drones also have to battle with difficult weather conditions during their flight. As a matter of fact, the flight itself brings a lot of issues even for cameras with electronic image stabilization. 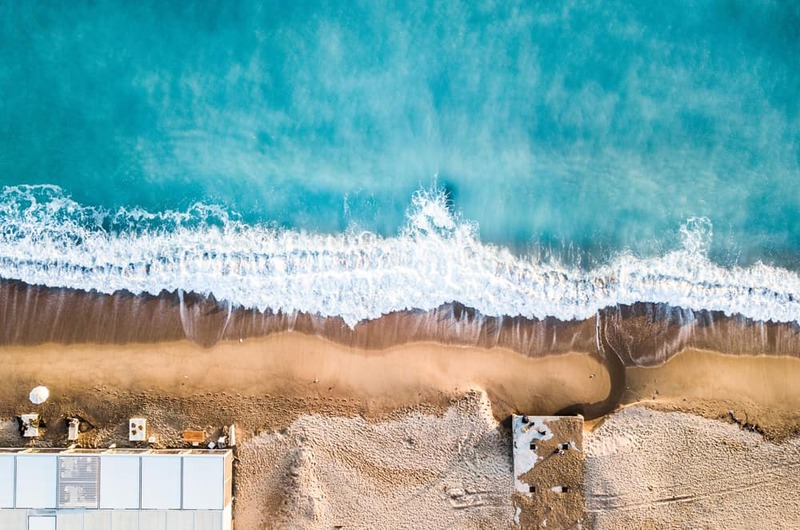 Vibrations and shakiness are huge issues when trying to capture breathtaking aerial shots with drones. However, there is a simple (yet costly) solution. The answer to all these issues are mechanical gimbals which offer unparalleled image stabilization. They possess several brushless motors as well as a built-in gyro that allows them to move freely across 3 axis and eliminate all shakiness and vibrations… if we are talking about a 3-axis gimbal, that is. There are 1-axis and 2-axis models too. They also do a great job with eliminating shakiness and vibrations but their 3-axis counterparts do a much better job and allow their users to move the camera freely with their transmitter. In the drone world, there are 2 main types of camera sensors. The size of them is a completely different story and it’s safe to say that DJI Phantom 4 Pro pushed the boundaries with its 1-inch CMOS sensor. However, the size won’t be the topic of today’s discussion. Nope – we will be focusing on the 2 main types of camera sensors and their most appropriate practical uses. Stands for Charged Coupled Device. This type of sensors is a lot more expensive to produce than CMOS which is basically the main reason why CMOS sensors have such a huge representation in various devices nowadays. However, CCD sensors don’t have rolling shutter problem and are much better at low light performance and have good dynamic range, making them better for certain applications such as FPV racing. Stands for Complementary Metal Oxide Semiconductor. 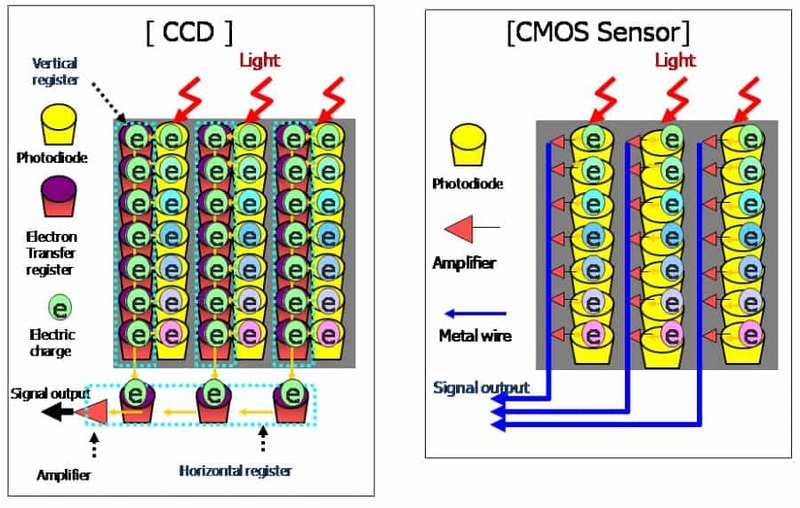 Just like I already explained above, CMOS sensors are cheaper to manufacture which led to them being inside of virtually all camera-equipped electronics. Smartphones, drones, digital cameras, laptops… you name it! They are more power efficient too and possess extra circuitry in the form of amplifiers in each pixel which do a lot of work once data starts arriving. I’m afraid that’s it boys and girls, ladies and gentlemen… oh who am I kidding, there are no girls here. Anyways, those were the 10 best drones with 4K cameras at the moment. There weren’t that many surprises but still a couple of CES 2018 (and post-CES) additions made it onto the list. The entire drone industry is keeping everyone at the edge of their seats with continuous growth and significant price drops. Mark my words – in February next year I’m 100% sure we will have drones with 4K cameras and mechanical gimbals for less than $500! Thank you all for sticking to the end of this article!